SmokeRx Review - Does SmokeRx Work to Help Stop Smoking? 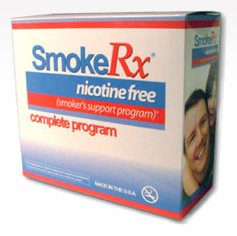 The SmokeRx smoking cessation program consists of three proprietary formulas containing herbs and natural nutrients to address the cravings and habits associated with smoking and to deliver nutrition to the body to counter the nutrients lost through smoking. The formulas do not contain any nicotine, but rather replace nicotine with other natural ingredients that bind to the body's nicotine receptors to reduce the cravings for nicotine and to lessen the symptoms of nicotine withdrawal. SmokeRx helps smokers to immediately resist their smoking habit while delivering nutritional and herbal support to promote a feeling of calm and well-being. Complimentary products are optionally available to support the three key formulas in the SmokeRx program and include a nutritional maintenance formula, a lung health supplement, and a mood and metabolism booster. The SmokeRX program is also effective in helping users to stop using other forms of tobacco, including chewing tobacco and snuff products. The three formulas in the basic SmokeRx program contain a wide variety of natural and herbal ingredients. Lobelia Powder, known for helping to relieve respiratory problems and for reducing cravings and stress levels. Licorice Root Powder, which soothes coughs and other throat and chest difficulties. Passion Flower Powder, helpful in promoting healthy digestion and aiding in relaxation. Sarsparilla Root Powder, known for its properties in controlling powerful cravings and for increasing concentration levels. Eleuthero Root, which helps to increase energy levels and to relieve stress. Echinacea Purpurea, helpful in supporting optimal immune system health. Elderberry Extract, known to support healthy respiratory system functioning. Ginger Root Powder, which supports digestive system health. Barley Grass Powder, helpful in supporting the cardiovascular system and as an immune system booster. Bayberry Root Powder, which helps to soothe irritated throats and to support immune functioning. Cayenne Pepper, a powerful detoxifying agent which also stimulates the digestive and circulatory systems. Lemon Grass Powder, helpful in combating stress, insomnia, and digestive problems. Peppermint Powder, an excellent ingredient for soothing the digestive system. Safflower Powder, which helps to promote a calming effect and to relieve restlessness. Bioperine Powder, which helps to promote the fast delivery of vital nutrients to the body. Piper Longhum Powder, known to stimulate the metabolism and to support lung health. Burdock Root Powder, which helps detoxify the body and purify the blood. Barley Grass Powder, an immune system enhancer which also promotes cardiovascular health. Golden Seal Powder, a potent anti-inflammatory which also strengthens the immune system. Oregon Grape Powder, which helps to aid digestion and in general detoxification of the body. Other ingredients include: Ox Bile Powder, Alfalfa Herb Powder, Ginger Root Powder, Buckthorn Bark Powder, Bayberry Root Powder, Dandelion Root Powder, Hyssop Leaf Powder, and Cascara Sagrada Powder. SmokeRx Formula C, the aromatherapy Support, is used to inhale for immediate relief of nicotine cravings and symptoms of nicotine withdrawal. It contains oils from Ylang-Ylang, Rosemary, Peppermint, Lemon, Camphor, Eucalyptus, and White Mineral oil as a binder and delivery agent. SmokeRx is available for purchase through a variety of authorized websites; the three basic formulas are priced as a package for $39.99. The price of the "Advanced Program," which includes the three-product package with an additional maintenance formula, is $49.99. A "Stress-Buster" package is available for $64.88 which contains the formulas in the basic package and also contains the mood and metabolism boosting formula. The "Deluxe System" package, which costs $59.99, includes the basic formulas and the lung health formula, as well. Amazon.com also carries the SmokeRx products at slightly reduced prices. All products carry a 30-day money-back guarantee; the customer may return empty bottles or the unused portion of the products within 30 days for a full refund, less shipping and handling. SmokeRX has a decent track record in helping users to stop smoking. The ingredients in the SmokeRx formulas are well-selected for their properties in helping to treat nicotine cravings and to reduce the severity of the symptoms associated with nicotine withdrawal. A fair number of smokers experienced success in quitting smoking by using the SmokeRx program; other smokers were not successful and relapsed quickly, possibly due to the program's failure in addressing the psychological side of an addiction to smoking and nicotine.